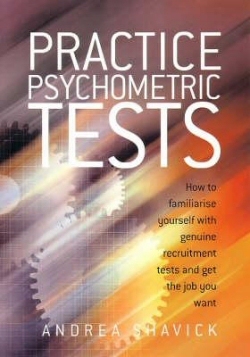 Following the success of Andrea Shavick's Passing Psychometric Tests and Psychometric Tests for Graduates comes this book, crammed full of even more genuine practice psychometric tests from SHL Group plc, the biggest test publisher in the world. These are the tests used by over 95 per cent of the FTSE 100 companies to select their staff, as do the police, the Civil Service, local authorities, the Armed Forces, the Fire Service, financial institutions, retail companies, the communications industry, the motor industry, the IT industry, the power industry...the list is endless. So if you're looking for a job, you need this book! * 52 genuine practice tests from SHL Group plc, the biggest test publisher in the world. * 334 questions covering verbal, numerical, abstract and spatial reasoning, mechanical comprehension, fault diagnosis, accuracy and personality, including the popular OPQ 32 personality questionnaire. * Whether or not it's possible to cheat! * How to improve your exam technique, speed up and concentrate. Above all this book will give you the three things you need to pass psychometric tests: information, confidence, and lots and lots of practice.